Melania looked stunning in the custom-designed baby blue ensemble. 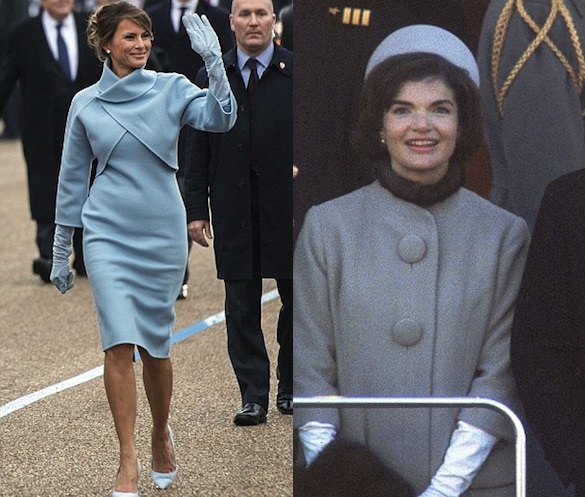 Many made note that it was a modern take on Jackie Kennedy’s blue outfit at JFK’s Inauguration. Supporting her husband as he was sworn in as president, Melania Trump looked a vision in a baby blue custom Ralph Lauren dress and coat. And as she stood by Donald Trump’s side as he took the oath of office in the Jackie Kennedy-inspired ensemble, the designer saw their company stock soar. When Ralph Lauren shares closed on Thursday before the inauguration, they were at $88.20 a share in what has been a quiet month for the American firm. However, by 11am yesterday, around an hour after Melania was first spotted wearing the designer’s outfit, stocks spiked at $88.32[sic]. By the end of trading yesterday, they had levelled off again, but still finished up at $88.90 a share. The Daily Mail report posted the peak number incorrectly, the price of the stock actually rose to $89.41. Ralph Lauren stock, (like some other designers,) has taken a hit in recent years. This spike in shares courtesy of the First Lady can get the company back on track. Melania is bringing grace and elegance back to the White House while giving a boost to a talented American Fashion House.